Pushed by Congress to upgrade to M-code, the U.S. Army is earmarking money for the new capability even as sequestration is forcing programs cuts, according to the service’s top acquisition official. 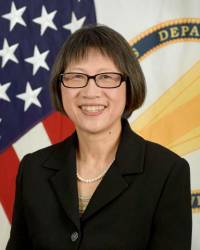 “We are heading towards the M-code capability,” said Heidi Shyu, assistant secretary for acquisition, logistics and technology. The Army has worked “our S&T (science and technology) pieces,” she said, noting that the Air Force was developing the necessary circuit cards through is Military GPS User Equipment (MGUE) program. Getting the money to make the upgrades may be harder than actually developing the new cards. Sequestration, which was delayed for two years as agencies struggled to adjust, kicks in again in fiscal year 2016 (FY16). “Every time I meet with Congress I asked them to please stop sequestration,” Shyu told reporters at the Association of the United States Army conference in Washington on Tuesday (October 14, 2014). “Unfortunately sequestration is the law of the land. And everybody I talk to says ‘Learn to live with it. Because it’s here.’"
M-code is a priority, however, and the money will be found she said. The across-the-board upgrades are happening just as NATO is sorting out compatibility issues between the militaries of its many members. NATO has been holding exercises and, in the process, discovered that many of its systems, specifically communications systems, don’t work together. “We have about 13 different systems for battle tracking within the nations that we work with — and all of them present challenges with talking to one another,” Maj. Gen. Walter Piatt, deputy commanding general, U.S. Army Europe, and commander, U.S. Army NATO, told Inside GNSS. Discovering the problems now, during a training exercise and not during a crisis, is actually good news, he said. Though satellite navigation issues have not yet come up in the discussions, they are certainly a factor, he told Inside GNSS. Shyu acknowledged that other countries might want their satellite navigation signals to be incorporated into NATO and/or coalition equipment. It may not, however, be necessary to choose one system over another, Piatt suggested, which could be good given that nations have already invested in systems and may not be able willing or able to spend much more.